TV show dates: October 1, 2017 — January 14, 2018. Performers include: Jeremy Piven, Richard T. Jones, Natalia Tena, Monica Potter, Blake Lee, Abigail F. Cowen, and Jake Matthews. 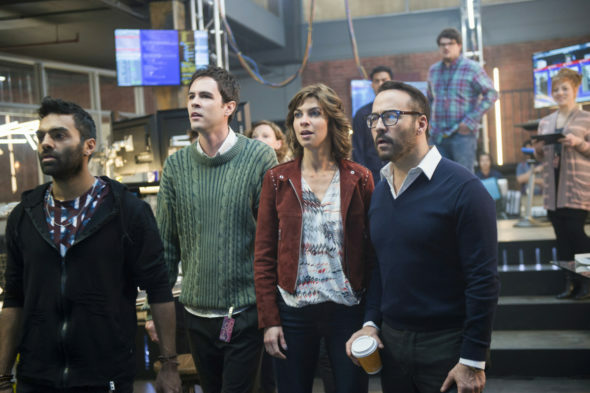 A high-tech crime drama, the Wisdom of the Crowd TV show centers on Silicon Valley entrepreneur Jeffrey Tanner (Piven). After his daughter Mia (Cowen) is killed, Tanner sets out to design an online platform for real-time, crowdsourced crime solving. In his obsession to find his child’s killer, Tanner is motivated by the idea that a million minds are better than one. He pins all his hopes on harnessing the “wisdom of the crowd,” in order to solve this crime and as many others as possible. Taking inspiration from Sophia, the personification of Wisdom, Tanner names the platform Sophe and drafts Detective Tommy Cavanaugh (Jones) for his team. Cavanaugh was the first police officer to investigate Mia’s murder and worked it until he was abruptly removed from the case. Meanwhile, Tanner’s ex-wife, Congresswoman Alex Hale (Potter), worries about his obsession. Despite their divorce, she cares for him. Although he was not a good husband, Alex appreciates that Tanner was a good father. Their profound grief has forged in them an unbreakable bond. Cavanaugh investigates the murder of a top Sophe user who filled his basement with conspiracy theory evidence. Also, Alex attends the release hearing for Carlos Ochoa (Ramses Jimenez), the man convicted of killing Mia. First aired: January 14, 2018. What do you think? Do you like the Wisdom of the Crowd TV series? Should this TV show have been cancelled or renewed for a second season on CBS? Another really good show cancelled. I’m starting to expect it. Great show – really enjoyed it! Bring it back! Couldn’t wait for it to come on. Great concept. Different! I am so sad this show ended. I thought it was gray. Not your average tv show. I love Jeremy Piven! Love the show, so bring it back.!!!!! I was fascinated by this idea, but stupid Piven (I used to love him, until I found out about his creepy-a**-behavior!)! There’s no reason that they have to cancel the show over THAT, though! Kill his character off and continue to find the daughter’s killer. If you want Piven off show just kill him off by the daughters killer and let his Ex-wife and girlfriend continue on to find the killer. CBS always cancels the good shows. I loved this show. Why cancel this beauty. incredible. I am so disappointed that this show was not renewed.